The Moana Surfrider, A Westin Resort & Spa is celebrating the special bond between mothers and daughters this May. 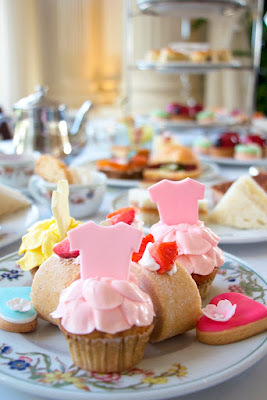 On Saturday, May 13, the resort is partnering with local fashion favorite Cinnamon Girl to present its Annual Mother and Daughter Afternoon Tea and Fashion Show at the Veranda at the Beachhouse. The fun begins at noon that day when mothers and daughters will be served a selection of savory bites by Chef Nolan West that include truffle egg salad tea sandwich, smoked salmon on rye with furikake cream cheese, pastrami on focaccia, duck prosciutto croissant and curry lobster roll for adults; and for children up to 12 years, savory bites that include ham & cheddar cheese, peanut butter & jelly, egg salad, turkey and Swiss tea sandwiches will be served. Both adults and children will enjoy sweets by Pastry Chef Nanako Perez-Nava that include Jasmine tea roll cake with fresh strawberry, guava macaron with chocolate daisy, Chocolate lady bug tartlet, Cinnamon Girl dress mini cupcake, flower icing cookies, and orange-blueberry scone with lilikoi curd and Devonshire cream. Each adult will also receive a glass of Tattinger champagne. And children will be offered a choice of tea, milk or juice. To complete the special tea menu, each guest will be served a scoop of refreshing green tea lemongrass sorbet. The Fashion Show begins at 12:30 p.m., when attendees will be able to see the latest in Cinnamon Girl’s lifestyle apparel made for moms and their daughters. The cost is $70 (plus tax and gratuity) for adults and $35 (plus tax and gratuity) for keiki up to 12 years of age. Guests will be given an opportunity to take selfies and group photos in front of a custom garland backdrop specially created for this event to remember this special mom-and-daughter experience. Make reservations for this one-of-a-kind celebration by calling the Dining Reservations Desk at (808) 921-4600. A credit card will be required at the time of reservations, plus the age of the keiki. Or, for more information see the Moana Surfrider’s Mother and Daughter Tea Page. Kama‘āina families can make it an entire weekend from May 12 to 14 to celebrate their mothers with a staycation at the Moana Surfrider, where rates begin at $239 per night and includes self-parking for one car, no resort charge (inclusions are a la carte) and no minimum night length of stay. Proof of residency is required at check-in, and rooms can be booked online at Moana-Surfrider.com or by calling 866-716-8140 and mentioning rate code KAMVIP.